Beef Brisket is a simple and inexpensive option for entertaining. 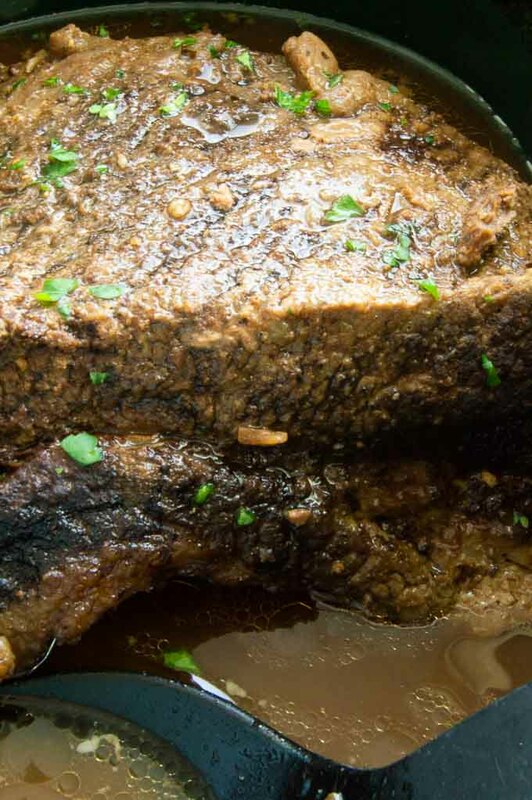 It’s made with just 3 ingredients and tossed into your crock pot and slow cooked for hours until you end up with a juicy, flavorful tender beef that is fork tender. It can be served on its own or as leftovers for sandwiches. Beef Brisket was a meal my mom served all the time when I was growing up. Her most popular version she called spicy beef brisket and was the very first recipe I ever shared on West Via Midwest. My mom was a master at entertaining and she used it often for large parties. With all of the entertaining I do these days I realize why she made this often. 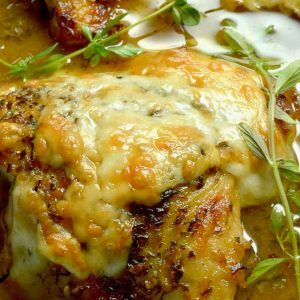 Not only because it’s a great recipe but it’s super economical and very easy to do for large groups of people. A brisket is the cut for so many meals like pastrami, corned beef , Sunday roasts and often for Passover meals served with caramelized onions. 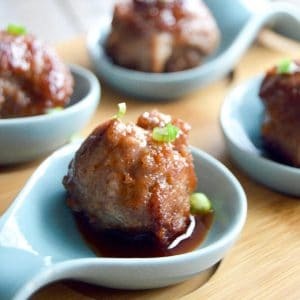 It’s a great meal for entertaining because you can make it ahead and just keep it warm for serving. Ideal for graduations too! What kind of meat is Brisket? Beef brisket is one of the nine primal cuts of beef from the chest area. 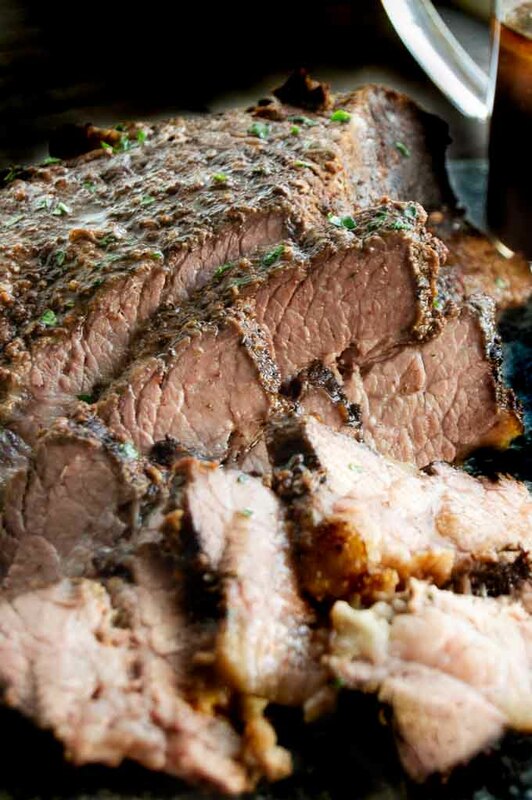 If the beef brisket is purchased whole it can weigh from 12-20 pounds. When you buy smaller ones at the market the butcher has more than likely split the whole brisket in two sections that are referred to as the flat piece and the deckle which is the point. The flat piece has less marbling in it but usually has a fat cap still attached to it which helps keep it succulent after cooking. PIN THIS TO HAVE ON HAND WHEN YOU NEED CRAZY DELICIOUS FOOD FOR A CROWD!! You can use whatever cut you prefer or what ever cut us available at your local market for the brisket. Any seasoning salt will work too but I really like the Lawry’s brand. It’s balanced and readily available everywhere which is very helpful. The liquid smoke gives the meat the smoky taste …. it’s very subtle but is a nice ingredient to really add great depth of flavor and make it seem like it is cooked for days in a smoker. I’ve always used the hickory smoke seasoning from Wrights but they offer others such as mesquite and applewood to try if you want to change things up. It doesn’t seem like a lot of ingredients but I promise you that the easy brisket recipe is jam packed full of flavor with just the 3 ingredients! Remove the brisket and loosly drape it over the base of the crock pot. Pour the liquid smoke over the top making sure any excess lands in the base of the crock pot. Using your hands massage the liquid smoke over all edges of the brisket. Sprinkle the salt evenly over the brisket. Tuck the brisket into the base of the slow cooker or crock pot. Cover and cook the brisket. Cut the brisket against the grain to get the most tender bite of the meat. Look at how much liquid renders in the slow cooker beef brisket. 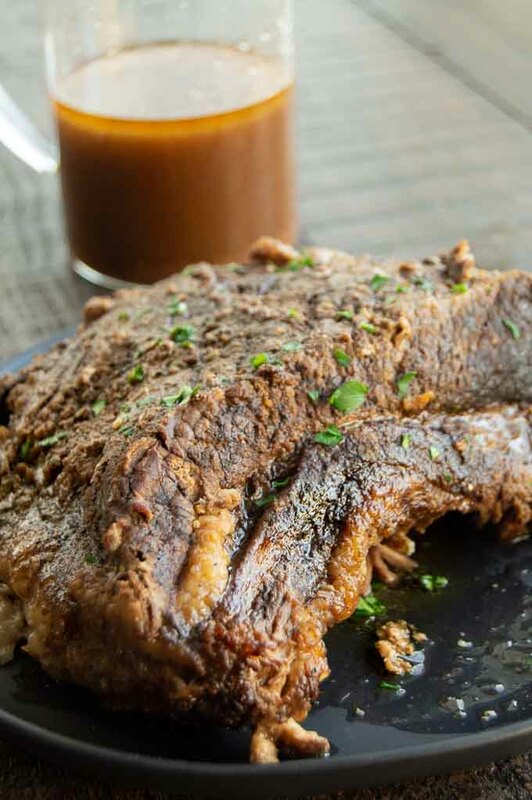 You’ll want to be sure and save that liquid for using as an au jus or thickening for a gravy. It’s also super helpful if you go to reheat the brisket. Pouring some of the jus over the top when reheating keeps the beef brisket nice and succulent. The trick to cooking beef brisket is to cook it at low temperatures for a long period of time. The cut of meat has muscle and marbling so you need to give it plenty of time to have those break down. If you don’t cook it long enough the meat will be really tough and stringy. Cooking on high heat is also not advised. The meat itself needs the longer time to break down the meat to make the brisket super tender. One of the best things about brisket, especially if you are using the flat cut is that even after hours and hours of cook time it will still hold its shape. While you can cut with the grain to get a more pulled like texture, if you cut it against the grain it will stay together and be super tender. Cook on low for 8-10 hours in the slow cooker (this is for the 4 pounds in the recipe.) If you use a larger piece of meat than the 4 pounds of beef brisket you will need to increase the time. Don’t worry about cooking too long, it will still hold its shape. Using the slow cooker is my favorite method to cook the brisket because it’s just such easy clean up and it frees up my oven for side dishes. Cook for 5 hours at 300 degrees in a roasting pan that will hold the liquid jus that renders during cooking. Cover with a lid if you have one, or wrap it in foil for cooking. Be sure and make sure the pan or baking dish you select even if you wrap it in foil is large enough to hold a lot of the liquid that renders. 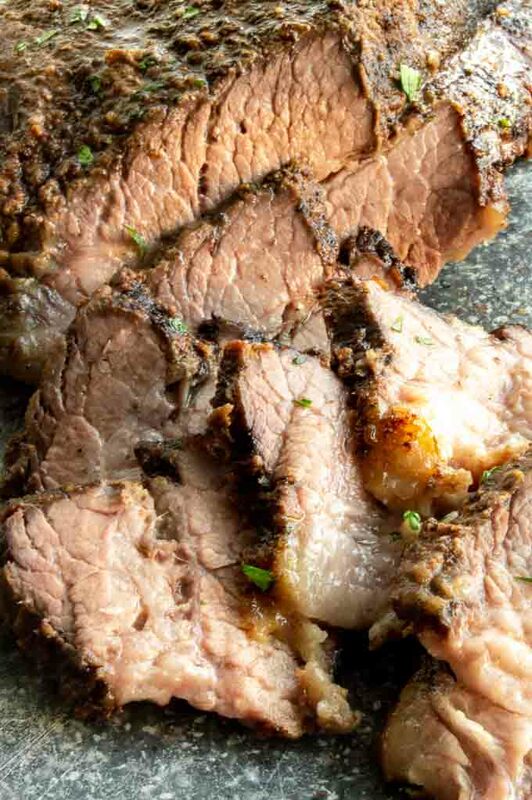 Oven Roasted Beef Brisket is perfect in the winter when you want to use your oven!! Cook the brisket on the grill on indirect heat at a very low temperature.. around 300° if your grill has a thermometer. Wrap the brisket in foil and place a drip pan below it to catch any juices that seep out. 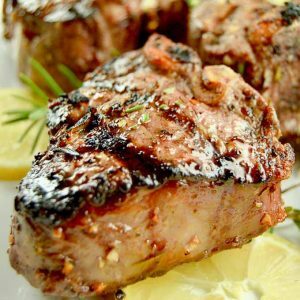 You’ll need to cook for 5 hours on the grill or until the meat can be pulled apart with a fork very easily. BBQ brisket is a great way to cook in the summer when you’re out by the pool! 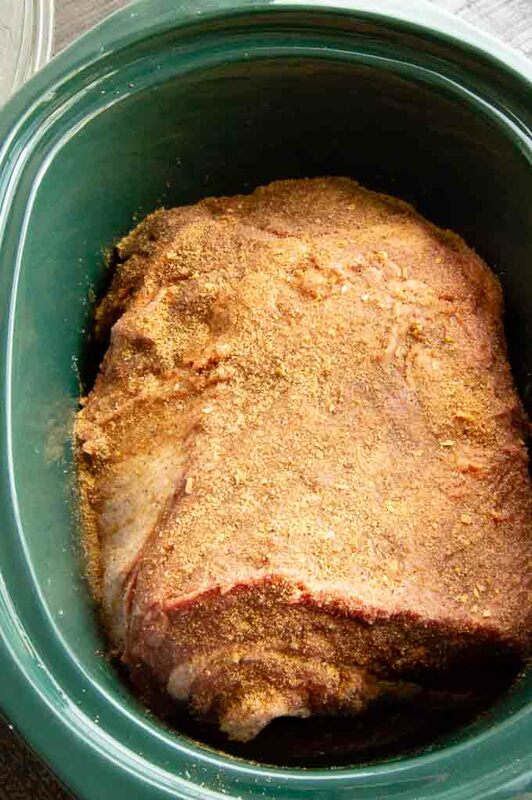 Common questions you might have when making this Crock Pot Beef Brisket. Can I use other seasonings instead of a seasoned salt on brisket? By all means feel free to switch things up and use any spice mixture, dry rub or seasoning you enjoy. I’ve used both my all purpose Pork Dry Rub and the Cajun Seasoning with great success. How much beef brisket do I need to buy per person? I usually figure 1/2 pound per person of uncooked brisket meat per person and then add a couple of pounds. That always allows plenty with enough for seconds. That being said we always make more than we need because it makes great sandwiches the next day. 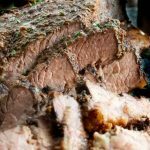 What can I substitute for the Liquid smoke on the brisket? 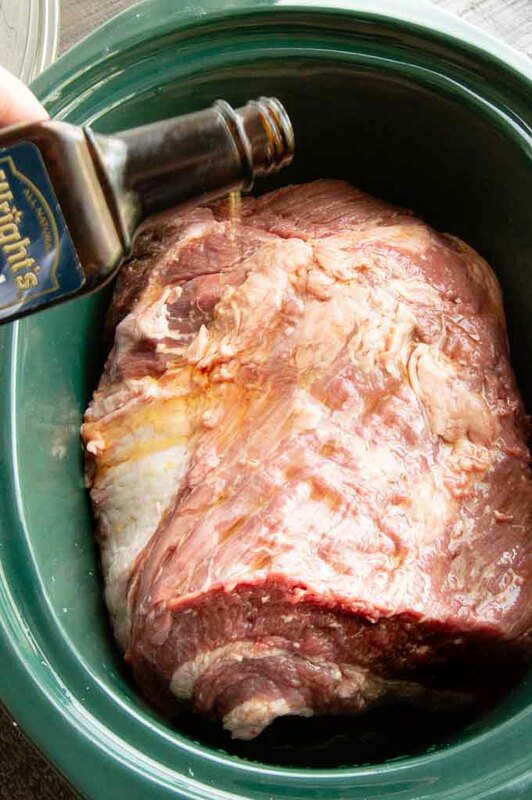 In a pinch you can use Worcestershire sauce on the brisket. The flavor is slightly different but it works well when you don’t want to run out and buy liquid smoke at the last minute. 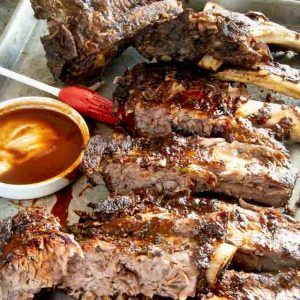 Are there sauces that go well with beef brisket? Yes! You can make the horseradish cream sauce or the mustard sauce to go with the brisket. Those sauces also work really well on the sandwiches or brisket sliders for the next days leftovers. And don’t forget your favorite barbeque sauce can work well the next day with sandwiches too! How can I tell which way to cut the beef brisket? To cut the beef brisket you’ll want to cut it against the grain. You can look at the photo below and see how nice and even the strips are. You can also see how the grain is in the photos. If you cut with the grain you’ll end up with more small tiny pieces, much like you would get if you were getting pulled pork. Juicy, pull apart tender and full of flavor this 3 ingredient beef brisket crock pot recipe is so easy. It's ideal for family dinner or special enough for entertaining. Easily adapted to oven or grilling. Add 1/ 2 cup water to base of crock pot. Trim away some of the fat on the outer edges of the brisket, remove from plastic container. Place brisket in the crockpot loosely. Pour liquid smoke over the top letting any excess liquid run into pot. 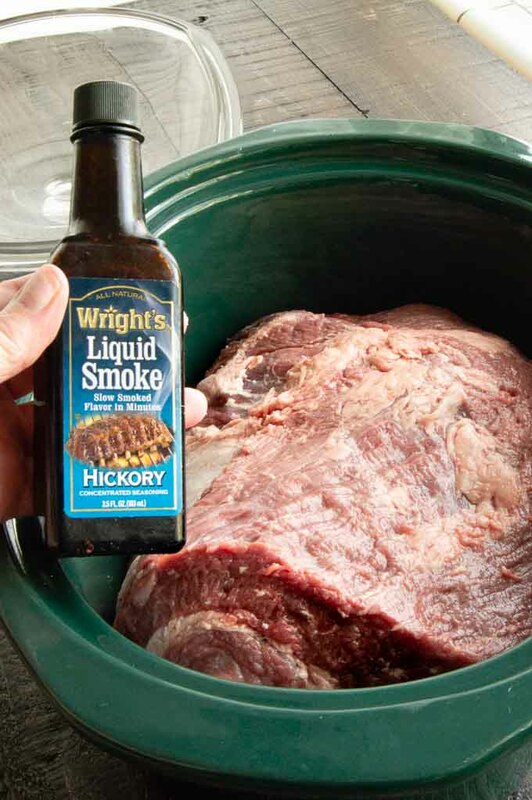 Gently massage the liquid smoke over all surfaces of the brisket. Then generously season all sides with Lawrys seasoning salt. 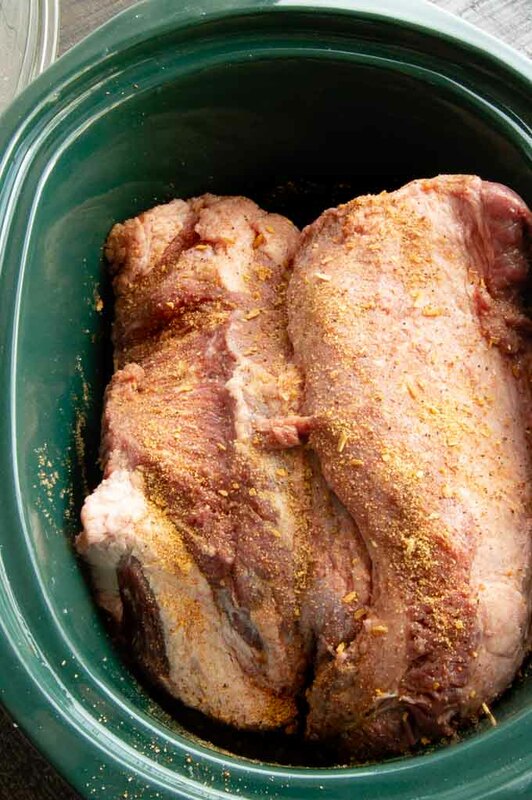 Squeeze the beef brisket so it fits inside of your crock pot. Cook on low for 8 -10 hours. Remove from the crock pot saving the jus to pour over the top. I can’t believe how flavorful this was with just a few ingredients.